As it turns out, the University of Bristol did complain about me to Berkeley. I found out recently that there has indeed been “private and confidential communication” at a “senior level,” as Sue Paterson, Bristol’s director of legal services, suggested in her thuggish letter to me last month. I haven’t seen this communication so I’m not sure exactly what it entailed, but obviously it involved my “actions and behavior” towards Bristol personnel (i.e. Professor Esther Crawley), which Ms. Paterson also referenced in her letter to me. Since Bristol would have sent a cease and desist letter long ago if it had been able to figure out any reasonable grounds to ask me to cease and desist doing what I was doing, I knew that any complaint made to Berkeley would not have taken that form. In her letter to me, Ms. Paterson acknowledged as much; she noted that no cease and desist letter had been sent, either to me or to Berkeley. Of course, Professor Crawley had falsely stated the opposite at the University of Exeter lecture I attended. I also knew that Bristol could not reasonably complain that I had libeled Professor Crawley. She herself made that accusation and then rejected all my efforts to seek an explanation for the charge. Bristol has likewise not provided me with any evidence of errors that need to be corrected. So it was inconceivable that the university would nonetheless try to convince anyone at Berkeley that I had, in fact, written “libellous” blogs. I thought perhaps Bristol might complain that I had attended Professor Crawley’s Exeter lecture and asked a question, but that also seemed highly unlikely. It was a public lecture, and I posed my question politely; then I left the room as soon as I was asked. Given that Professor Crawley invoked the possibility of calling “the police” about me, she might have perceived and described the incident differently. But Bristol knew there was a video of the interaction. I assumed they would not want to characterize what transpired in a way that could easily be disproved. By deduction, the only other possible complaint I could imagine was that Bristol would characterize my tone and actions as somehow unfair or mean. Moreover, Ms. Paterson’s letter to me had referenced the “close and valued collaborative relationship” between Bristol and Berkeley. I assumed Bristol might try to use any such connections as leverage in asking Berkeley to discipline me in some way. In any event, whatever was mentioned in these senior level communications, I am pleased to report that Berkeley—unlike Bristol–has behaved as befits an academic institution. Those responsible for reviewing the matter have reviewed the matter and have confirmed that I have done nothing wrong. The university has affirmed my right, as a public health academic and journalist, to pursue my current efforts. That means I can continue to express my strong opinions involving scientific research and related matters without having to worry about unwarranted and inappropriate threats targeting my academic position. The same applies to attending public lectures and asking questions in a respectful manner, even tough questions that might be unpleasant to the person being asked. So let’s move on. Next week: My response to BMJ Open’s description of the debate over Professor Crawley’s ethically challenged school absence study. The journal’s accounting of the events was included as part of the agenda for the November meeting of a regular forum hosted by the Committee on Publication Ethics. I will explain why BMJ Open’s statement is inaccurate and misleading–an apparent effort to whitewash its dereliction of editorial oversight in publishing research that cited specious reasons for exempting itself from ethical review. Just let us know if you need letters of support from those of us with a strong interest in your journalistic covering of this devastating illness in a fair and appropriate way. I’d be delighted to praise your work and intentions to Berkeley administrators. It seems an apology from them is long overdue. Will the video be accessible to the public at some point? So it means that Ms. Crawley, by saying that a ‘cease and desist’ letter was sent to Berkeley, was either misled by Bristol University or else she decided to use that phrase to make the most public impact and discredit you in that situation. Either way I think this needs clearing up. She either needs to apologise to you for deliberately and publicly making an untrue statement about you or else she needs to tackle Bristol Uni for misleading her. I think it might be worthwhile chasing this up. For what it’s worth I never doubted that she was wrong. I sincerely hope that if she was misled by Bristol Uni she will take this opportunity to immediately clear her name. I know I would if I were in her shoes. Let’s she how she jumps now…. It’s a bit sobering to read this quote from the BMJ in 1983. Are we going forwards or backwards? I would have been really surprised and disappointed if UC Berkeley had behaved in any other way about this. Academic discussions are _supposed_ to be combative, though of course in a civilized way, so that truth can emerge. It is remarkable to me that anyone would think otherwise. It is excellent news that Berkeley have not seen fit to engage in Bristol’s attempts to halt your work, David. The unfortunate thing is that not all institutions have been, or will be so robust. I agree that his incident warrants a public apology from one of the parties. It is great and to be expected that Berkeley should sand up for you in this circumstance, but shouldn’t you have been informed of the contents of this ‘private and confidential communication’ since it was about you, as a matter of natural justice? It is an accusation about you, after all. I’m very pleased so far, though. Thank you and Happy Christmas to you, David. Excellent, good to know your connected to a university that put garbage in the bin…where it belongs. Let’s see when the next tantrum episode is in stage…can’t wait. Manon and I with you all the way, and as Alicia Butcher Ehrhardt says we would be happy to write any letters of support. Every piece of your work exposes Crawley’s dishonest and harmful research on ME. So pleased to hear that Berkeley quite rightly confirmed that no wrongdoing was done. They obviously understand the concepts of free speech, critical thinking, honesty, and standing up for science, and that doing the job you are employed to do involves those. Unfortunately Bristol gives the appearance of unfamiliarity with such concepts. Great news about Berkeley. An early Christmas present for us. What a pity the US is shaming the UK with research and journalistic ethics. Thanks David. happy that you do not ‘ cease and desist’ but go on opening this cesspool. yup, it stinks and those responsible try to wiggle out of it. But all those patients outside are just a mite more important than the hurt feelings of scientists. Can’t wait to see the next installment… the BMJ / COPE incestuous shenanigans seem ripe for some unfettered commentary. An entirely appropriate response from Berkeley. Anyone experimenting with the Lightening Process on children should expect ethical scrutiny and should not try to suppress it via academic heirarchical politics behind closed doors. In my opinion these events reflect poorly on ethical and professional standards at Bristol psychology dept and ought to be a serious concern for the governing body of Bristol university. Yes so true. They are trying to force the science to fit their pet theory by set up, outcome switching, manipulation and cherry picking the data, rather than let the science speak for itself, which would otherwise disprove their theory. This is not just a crisis for patients with ME, but a crisis for science and an attack on the scientific method. Well put. We are seeing another tragedy for British science unfold. The nation of Newton and Fleming is being sunk under the waves by ambitious pretenders at science. Fool Britannia. I have followed your blogs on this particular issue with interest. It has long been my opinion that Crawleys arrogance will be her undoing. Unlike her mentors, she lacks the intelligence to play the game of deviousness effectively. Woohoo! Go, Berkely. David is helping many many very ill people with his writing. I still wonder how it can be possible that somebody like Esther Crawley can continue spreading lies, performing quack research and still will be backed up by the University of Bristol. That tells us a lot about the University of Bristol doesn’t it? A couple of years ago I never would have believed this, but we all have experienced that strange mechanisms take place and that is not to the benefit of science. This happens in the UK as well as it happens in The Netherlands. Although various British institutions are complicit it’s good to see that it doesn’t reach as far as America. Thank you David for all your hard work. Is the somatization quote somewhere else in the letter? It isn’t in the part that is in the photo. Work in uncovering misleading research that supports false hypotheses is equally as important as ‘blue sky’ research that breaks new ground. Maybe, just as SMC has set up its ‘Maddox Prize’, Berkeley should set up a ‘Carl Sagan Prize’, from his famous ‘Bullsh*t detector kit’, and his association with Berkeley. This could give annual recognition for the most significant work at overturning false hypotheses that are long past their sell-by date and holding back scientific progress. This work deserves to be written up into a cautionary paper so that it gets widely studied by young scientists, and is regularly referenced in the literature. Yes. You’d need to access the full text. I got it out of a book. Wow! Richard: you’ve really come up with a paper and a half!!! It doesn’t actually the quote you’ve given, but I could quote the whole thing! Popper’s analysis is brilliant, and, although it doesn’t spell it out with our situation in mind, I think it explains why the CBT ‘researchers’ won’t accept that they could be wrong: Scientists are never really wrong–they just come up with different results than they expected, and learn something new–. Medical doctors are expected to be right: most of the CBT lot are types of medical doctor, and they have a powerful professional imperative to be ‘right’. This makes them constitutionally unsuited to be research scientists. “The old view of the growth of knowledge, especially of scientific knowledge, is still widely held. According to this view,knowledge grows by accumulation: we discover and collect more and more facts. This view is not,of course, totally mistaken. Knowledge does grow, here and there, by accumulation. Yet far more often knowledge grows by the recognition of error by the overthrow of old knowledge and mistaken theories. Even the discovery of a new species can be the correction of a previous hypothesis. What was regarded as one virus may prove to be several different viruses (or vice versa). … 4) Errors may lurk even in our best tested theories. It is the responsibility of the professional to search for these errors. In this he can be helped greatly by the proposal of new alternative theories. Thus we should be tolerant of ideas that differ from the dominant theories of the day and not wait until those theories are in trouble. The discovery that a well tested and corroborated theory, or a commonly used procedure, is erroneous may be a most important discovery. This brilliant paper explains everything about the whole Crawley/PACE etc. fiasco. 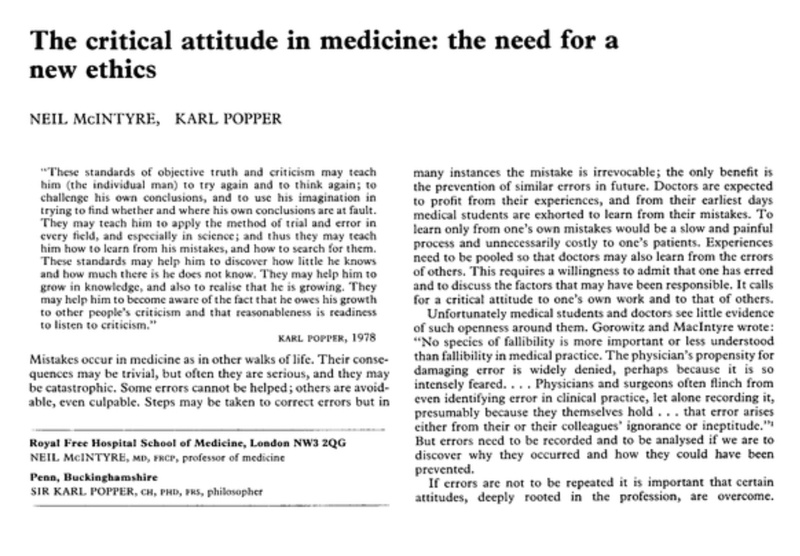 They *can’t* accept mistakes *because they are MEDICAL doctors*. Thanks so much for following this up, Steve. I got it from a book in the ‘90s, but never chased up the article. What you’ve pasted in is excellent. I’d never got around to reading any Popper, so I thought I’d try to check, as the language of the quote didn’t seem quite right for the period. It took a bit of finding, but, luckily Google Scholar has now indexed quite a long way back, and the old papers are being made into pdfs. This one proved to hit the jackpot! So I’m very pleased I happened to pick up the phone and read through all the comments! Nice one. UC Berkeley 1 – Bristol University 0. I’ve not yet read the whole article due to lack of energy. Steve, in case it helps, that quote is used here http://www.biomedico.pl/publikacje/The-Role-of-Food-Intolerance-in-Chronic-Fatigue-Syndrome.pdf and is attributed to the McIntyre and Popper letter. I think it might be from Lipowski ZJ. Somatization: the concept and its application. Am J Psychiatry 1988;145:1358-68 but I can’t get access to that. It’s not in the McIntyre & Popper letter Andy. I found it via Google Scholar and posted very good excerpts above, but the blog is holding it back at the moment. The paper is a very important one for helping to understand the psychology of what is going on here, and I’m very pleased to have my attention drawn to it. I would imagine the quote above is a quote that someone has justified by reference to the Popper & McIntyre paper, and the links have got confused. There are no comments waiting for moderation. Comments are automatically posted unless they contain content that is flagged by the system (certain words, more than two links, etc). When I see those I take care of them, but I don’t see your comment (or anyone else’s) waiting to be approved. Please try again.